Review posted October 18, 2008. Listening Library (Random House), 2007. 13 hours, 17 minutes. 11 compact discs. I had not one but two parents tell me that their kids loved this book. When I saw it on audiobook, I thought I'd give it a try. Audiobooks are working well for me for light-hearted fiction that I can enjoy in small doses. Renny Muldoon is a brilliant orphan who knows he is completely different from other children. When he sees an ad offering a test for gifted children looking for special opportunities, he goes to the test and begins the adventure of a lifetime. Renny ends up on a team with other exceptional children who are offered a dangerous mission with the fate of the world at stake. 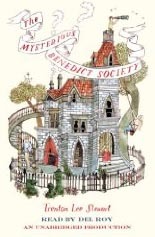 The mysterious Mr. Benedict explains why only children can save the world now. The adventure yarn that follows is a lot of fun. Sure, there are several coincidences and several places where believability is strained. However, it's definitely an entertaining and exciting story. Del Roy's voice sounds like a kindly grandfather telling you a story, and I quickly thought of his voice as coming from Mr. Benedict himself. This book is excellent for upper elementary age children who will enjoy some good, clean, and clever fun.